(11:40 a.m. EDT) -- Anyone with a cruise booked from Miami onboard Norwegian Sky in 2016 can take advantage of the line's newest offering: free, unlimited beer, wine and premium spirits. Available only on Sky, most drinks up to $11 will be included -- similar to the Ultimate Beverage Package -- ranging from wines by the glass, beer by the bottle, tropical cocktails and even unlimited soda and juice for passengers ages 3 to 20. "We're taking Freestyle Cruising to the next level to provide our guests with an experience unmatched by any other contemporary cruise line," said Andy Stuart, president and chief operating officer for Norwegian Cruise Line. "Norwegian Sky guests will have the freedom to enjoy a cruise vacation the way they desire -- whether it's lounging by the pool with a margarita, having a laugh at a comedy show, catching up on their favorite book on their balcony, or indulging in fine dining -- all included in their cruise fare." Right now, the line has no plans to roll out unlimited drinks to other ships. When asked if the new inclusions would drive up the price, Vanessa Picariello, senior director of public relations for Norwegian Cruise Line replied, "We expect that this will increase demand, which -- as you know -- will drive bookings and ultimately price." 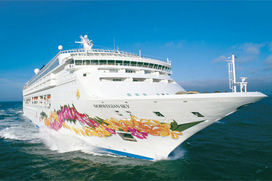 Norwegian Sky sails three- and four-night roundtrip cruises from Miami to the Bahamas year-round. The unlimited drinks package will also extend to stops at Great Stirrup Cay, Norwegian's private island in the Bahamas.